Amazon.de Gift Certificates* never expire and can be redeemed towards millions of items at www.Amazon.de and certain of its affiliated websites. Amazon.de's huge selection includes products in Books, Electronics, Music, Movies & TV Shows, Video Games, Software, Home & Garden, Sports & Outdoors, Kitchen & Dining, Computer & PC Hardware, Watches, Home Appliances, Office Products, Camera & Photo, Pet Supplies, and more. Amazon.de is the place to find and discover almost anything you want to buy online at a great price. *Amazon.de is not a sponsor of this promotion. 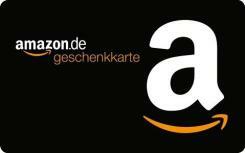 Amazon.de Gift Certificates ("GCs") are redeemable only for eligible products on Amazon.de. Return policies for products are available on Amazon.de. Except as required by law, GCs cannot be reloaded, resold, transferred for value, redeemed for cash or applied to any other account. To view a GC balance or for more information about your GC, visit "Your Account" on Amazon.de or contact us at www.Amazon.de/contact-us. GCs cannot be used to purchase other GCs. Amazon is not responsible if a GC is lost, stolen, destroyed or used without permission.